The blog is going on a short hiatus this week while I am in Washington D.C. to attend a Patent and Trademark Librarian Training Session. My first business trip! So far, it has been all sight-seeing, but Monday morning we buckle down. I'll put up plenty of pictures when I get home. In the meantime, go outside and enjoy spring! OK, here is a quickie reference link today, for all the teachers out there: Netstate.com. A website with basic information about all of the states, including the year it became a state, where the name came from, and the various nicknames. If you click on the links in the sidebar, you can find even more interesting facts. For example, did you know that the official cooking vessel of Arkansas is the Dutch Oven? Or that the square dance is the official dance of both Washington and Arkansas (and, I feel sure, at least a couple other states...must be a strong square dance lobby out there). The facts have some sources included, so you can go find more information, or at least be sure your students are getting real information. Addendum: There is a strong square dance lobby out there! At one point they were trying to get the square dance to be the state dance for all of the states! It's on this website, if you look for it. This past weekend marked the start of Spring Break at UCA, meaning that Benjamin has a week off from teaching and getting up early. We wanted to take advantage of that and get outside for a couple of days. 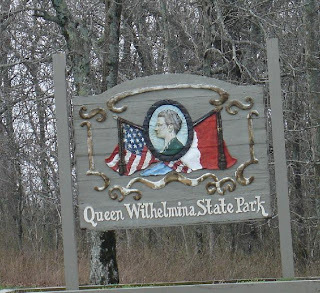 Donna and David invited us to hike a section of the Ouachita Trail with them at Queen Wilhelmina State Park on Monday. We decided to head to the park on Sunday, and camp out for the night first. The park, which is almost to Oklahoma, is on top of Rich Mountain, reportedly the second highest mountain in Arkansas. I don't know about that, not being one for the numbers, but it was steep (both driving and hiking up) and it was windy. Boy was it ever windy! It sounded like we were at a beach with 6 foot waves constantly crashing around us. During our preparations for the hike, we discovered that our trusty tent had been stolen out of our storage unit (it was broken into a couple of months ago - at the time we were more worried about our brand new backpacks and didn't notice the tent was missing). We were about to leave, so what to do? In a word, tarps. 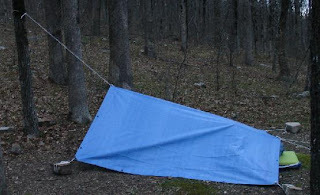 Thanks to a comment by our friend Greg last week, and memories of my dad's tarp, we headed to SprawlMart and bought a couple of tarps and a length of rope. It was a lot lighter to carry, and easier to pack, and worked well enough, although it wouldn't keep bugs out, if it were mosquito season. The big problem? Snapping. The wind (did I mention it was windy?) would lift up a part of the tarp and snap it, right above our heads. The great part about hiking in spring is seeing all the wildflowers. 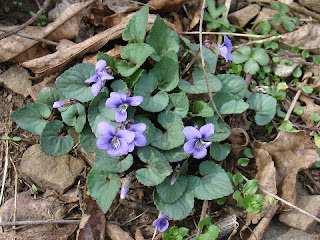 Although it is still a bit early for some of the flowers, there were still plenty to see, including the crabapple above and the violets below. Spring did seem to be a couple of weeks behind up on the mountain - they still had daffodils blooming at the lodge, and there were no leaves on any of the trees yet. Here in Little Rock and Conway, there is more green visible every day. Spring is also supposed to be a great time to see waterfalls here in Arkansas. I am hoping that we will get a chance to go back to Cedar Falls at Petit Jean while there is still water in it. When we went in August, it was just a tiny trickle. But that will have to wait until some time in April - I am off to Washington D.C. next weekend for a training conference. 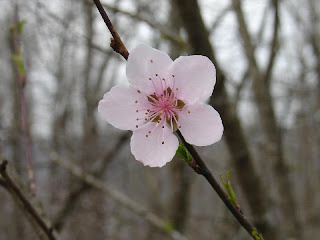 It is finally, officially spring today (even though we sprung forward two weeks ago). The daffodils are about done, but the tulips and hyacinths are blooming. Trees are starting to get leaves, and the sun is shining. Next week, Benjamin is on Spring Break. Since I have to work, we won't be able to go on any long trips, but we are going to go for an overnight excursion and hike. Ah, wilderness! Do you live in an earthquake zone? 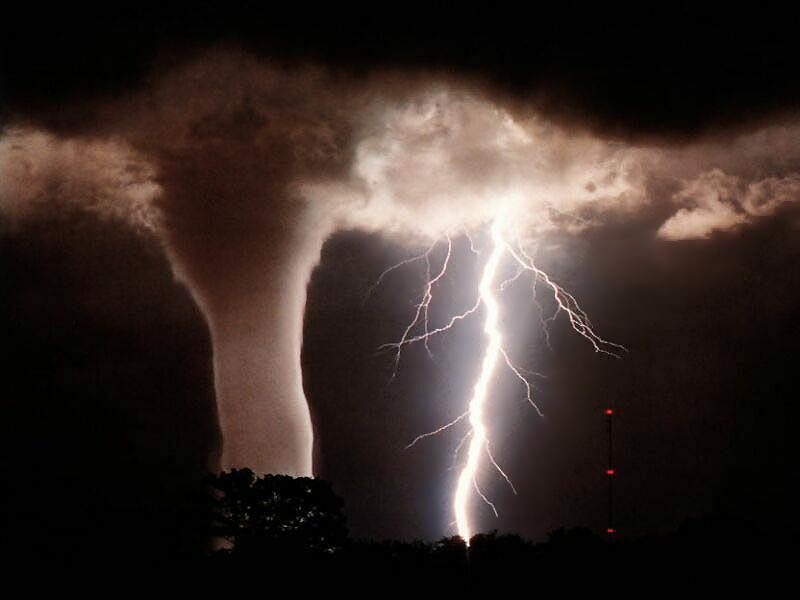 Tornado Alley? Blizzard-ville? On the Hurricane Coast? Do you live on the planet Earth? If you answered yes to any of these questions, then you should be prepared for a disaster. Mostly, we don't like to think about the bad things that could happen, because they scare us, shake us out of our comfortable lives and remove any pretense we might have that we are safe. But when disasters strike, we are better able to survive and adjust if we have a plan. The government has put together a comprehensive web site to help you put together a plan and an emergency kit that could just save your life. For example, you should enough water and food for every person in the household for 3 days. If that food is in cans, don't forget the can opener! Also, if you have pets, you should also make sure you have enough food and water for them as well. If you take medications, try to have a supply of those stored or handy. What else should you have? Check it out at Ready.gov. Is there such a group? If not, there should be. I would join. No matter how much I tell myself that I am just stopping at a library to return a book, or because Benjamin needs something to read, I always come home with a book, or more often, several books. I have a physical bookshelf in my bedroom that is overflowing with books I want to read, and my GoodReads to-read bookshelf is closing in on 200 books (some of those books are the same, but not the majority of them). On Saturday, we went to the Central Arkansas Library System spring book sale. I bought more books, none of which were on my to read shelves. I work in a library, and just walking from my desk to the break room can be a journey fraught with peril. I currently have 11 books on my desk: three to review for our new blog: ASL Ref Dogs, two that I picked up spontaneously because they looked interesting, one that I picked up to look at before passing on to someone else, two that I am actually reading, one I keep trying to start, and one I checked out last week, but haven't had a chance to start yet. 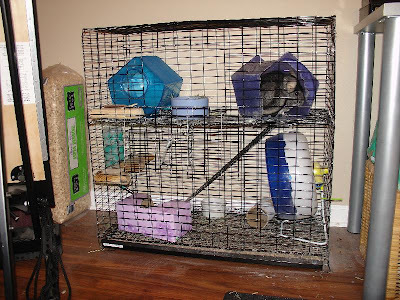 Kirby arrived fully set up in the way of housing: two plastic houses, plus a third for bathing (chinchillas have to take dust baths on a regular basis). One of the two houses in the cage had been subjected to Kirby's teeth, and the entire back end of it had been nibbled away. 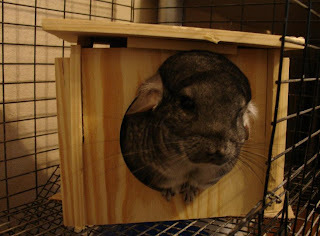 I left it in the cage at first, because he seemed comfortable with it, and I didn't want to stress him out too much. Kirby takes a look at the nosy neighbor with a camera. Last week, I noticed that he was starting to feel more at home with me, and (here's the important bit) he was starting to gnaw on everything in his cage again. (I presume he was still in a bit of shock before, because he was only attacking the cardboard tube up until last week, ignoring the wooden chew sticks I provided). This included his house. 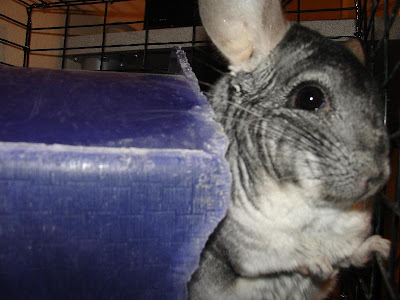 Now, I don't know about you, but if I avoiding plastic cooking utensils because they are bad for my health, should I really allow my chinchilla to eat it? No, of course not. So, this weekend, Kirby got a new, wooden house. As you can see, if you look closely at the roof, he has already started chewing on it. I left one of the plastic houses in because he hasn't shown any inclination to chew on it yet, and because I wasn't sure he'd like the new one. Since he does, that house may go next. This weekend, thanks to a trip to the Boulevard Bread Company in Little Rock, I was freed from baking a regular loaf of bread. 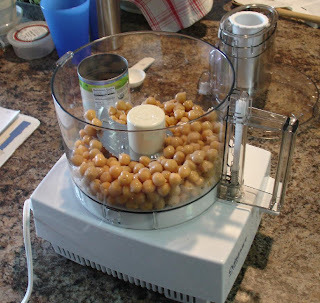 I decided to use my baking time to make hummus and pita, using my new food processor. For those of you, like my dad, who want to know about the pocket in pita: I have no idea how the commercial producers get the pocket in the pita. I have never had any pockets. It must be a different sort of process. I have made pita in the past, using the bread machine to do the mixing and rising. This time, I decided to try a recipe from one of my bread books. After using it, I can say that it is a pretty book, but not the most practical when it comes to actually baking bread. Everything was going fine, until I got to the actual baking part. For one thing, the recipe had me letting the pita rise on the counter. This is a bad idea, because 1) the dough tends to stick to the counter, and 2) I have to handle it to get it on to the baking sheets. This destroys any bubbles and rising that may have taken place. The other thing that the book had wrong was the baking temperature/time ratio. 450 for 15 minutes?! 13 minutes (at which point I got wise and pulled the plug, er pita) was too much. But, they weren't destroyed, and still taste really good, especially when covered with hummus and feta. I got the food processor last week as an early birthday present. We have been cooking along fine without a full sized machine for 8 years, but lately I have run into a bunch of recipes that would be a whole lot easier with one. Such as hummus. The recipe I use is from a Lebanese woman my mother met, and is pretty good. 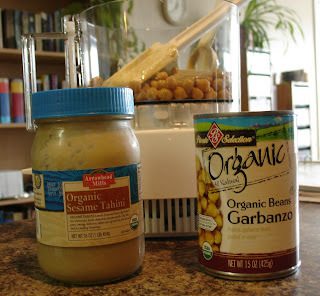 The end quality will be determined by the quality of chickpeas and tahini, as well as your ability to easily blend everything together. What is with this weather? or I feel vindicated! Our weather this week: Sunday - mid 70s, Monday - 80, Tuesday - mid 70s, Wednesday - 40, Thursday - 33. Tonight - chance of sleet and freezing rain, temps in the 20s. Now, I am OK with 80 (although I could do without the 80% humidity that went with it), and I am OK with 33, but I would prefer them to be separated by a month, or at least a couple of weeks. It is impossible to know how to dress, which coat to wear. We used to have the same problem in Austin, but not in New York or Washington. Huh. In related news, researchers at Harvard have concluded that a hike in temperatures can cause headaches. Check out the NPR story about this here. Aha! And it has been known for a while that barometric changes can cause migraines. So, with these two pieces of information, I feel vindicated in my beliefs that it is totally not my fault that I have headaches when the weather changes and when it is hot (either one of which is usually happening here in Arkansas). I have been reading a lot of blogs lately, mostly food-related, and some of the best have regularly recurring themes. So, I am going to try something new - a regular (well, that's what I say now!) weekly post about an interesting, useful or otherwise noteworthy reference source. Since this is a blog, and therefore online, I will try to keep these to online sources, but I won't guarantee that they will always be so. Today's inaugural reference site is the Australian War Memorial web page. "One of the finest military artefact, document, and media collections in the world" (their own description) related to various wars, the web site has pictures, virtual tours, genealogy information, and exhibitions. This picture is from one of the online exhibits, "A is for Animals: An A to Z of Animals in War." According to the description, this kitty was a mascot for a light cruiser during WWI. Check out the exhibit for pictures of a German doggy gas mask, other mascots, and working animals. I hate Daylight Saving Time - not because I notice the lack of sleep, but because it makes a lot of people around me very sleep deprived and cranky. Benjamin always has a terrible time trying to adjust, and, judging from the grumbling of my co-workers, so do they. Actually, I don't entirely mind this change, because it also throws the cats off - instead of waking me at 5, they wait until 6, at least for a little while. My personal objection centers more on the daylight aspect of it. While I enjoy the increase of light in the evening - we can got for walks, after dinner, in the light! - I seriously resent the lack of daylight in the mornings that comes along with it. Driving to work in the dark is a pain. And since I am not particularly far north, the morning light will never truly catch up to where it was before we switched. Kirby seems to be settling in now, about 3 weeks after he arrived. He no longer barks at the cats when they come to investigate, and he doesn't always hide from me. The cats find him a little intimidating, I think. He isn't like any rodent they have seen before - Cleo and Oliver are used to hamsters, and I'm sure Creamsicle is accustomed to mice - he is big, and can make loud noises. Not dinner, that's for sure! Anyway, they mostly ignore him, except for occasional staring matches. He loves raisins, and will try to force himself between the bars to reach them if I have them in my hand. 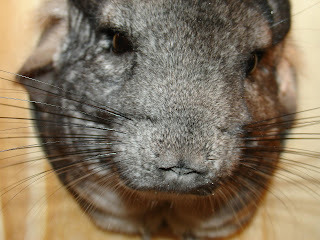 I think they must be the chinchilla equivalent of crack. He also likes dried apples and his daily ration of Timothy hay. With the apples, he will take the piece in one paw (he is right pawed) and nibble on it. I haven't gotten a picture of that yet, but it is pretty cute. He gets time out of the cage most evenings to hop around the computer room. He doesn't always want to come out though, and when he does, I still can't pet him. My attempts have sort of turned into a game - he will come so close he is almost touching me, I will reach out, and he will hop off. Repeat until he tires of exploring and goes back to his cage to eat or run on his wheel. I'd love to get him a larger, more interesting cage, but like many things these days, it will just have to wait until we have a house ourselves. I hinted at a daffodil post last week, and now that my new camera is here, I can finally follow up. The daffodils are blooming here in Arkansas. I love daffodils. 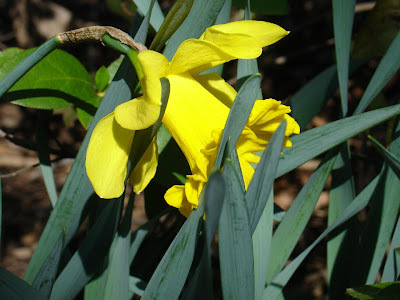 Don't get me wrong, I love tulips and hyacinths and paperwhites and all those other blooming harbingers of the season, but daffodils have a special place in my affections. I am not sure when they first became my favorite sign of spring, but it may have been college. First of all, the Whitman College campus is covered with daffodils, so much so that you can hardly get away from them. They are so bright and cheerful in the gray of a northwestern spring. Secondly, the Safeway store just down the street from my dorm used to carry (may still , for all I know) daffodils, 2 bunches for $5. This was a great bargain for a poor college student, and a wonderful way to brighten up a dorm room. I bought a vase for a dollar from the thrift store, and filled it with daffodils every week for as long as they were on sale. When we moved to Texas, flowers of all kinds became an indulgence, a luxury - I guess spring flowers just don't like the short winter and hot spring - $10 or more for 6 sad little tulips or daffys. And they don't like being transported half-way across the country. In New York last year, I planted some of my own daffodils, and was pleased to discover additional bulbs sprouting from the previous owners. This year, I am back in an apartment and have no daffodils of my own, but like college, there are daffodils everywhere for me to enjoy. And, in the garden of the empty house next to our building, there is a row of daffodils, waiting to be admired. After not baking anything last weekend, I did quite a bit this weekend. On Thursday, for a work party and philosopher's widows night, I baked ginger cookies - sorry no pictures of those. They are all gone, thanks to the many hungry mouths. Because they are so easy to make, and aren't too rich, they are great to make for parties or pot lucks. At the office party, E. brought a very yummy banana pudding. I have never had banana pudding (according to the various Southerners there, it is because I am a deprived Northerner), and I am going to have to try making it some time. 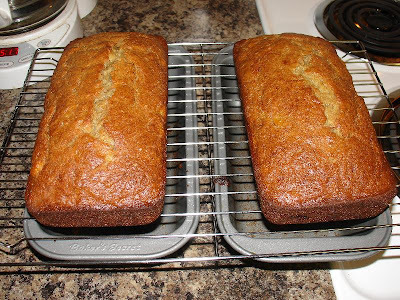 While I didn't do that this weekend, I was inspired to make banana bread - that, and the large number of bananas in my freezer. I like making banana bread in two smaller pans, instead of the large pan called for, because Benjamin and I cannot (should not) eat an entire loaf at one time. By making two, I can stick one in the freezer for later, when I don't want to bake. Anyway, it turned out really well. 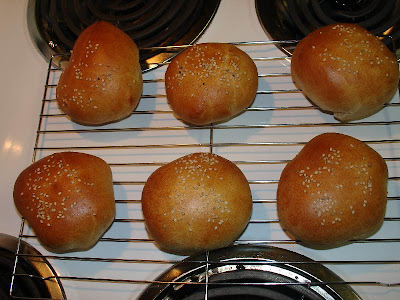 At the same time on Saturday, I also made hamburger buns. In Austin, we used to buy fresh baked bolillo rolls for buns, but the only buns here are pasty, high-fructose laden bread impostors. So, we have taken to making our own. 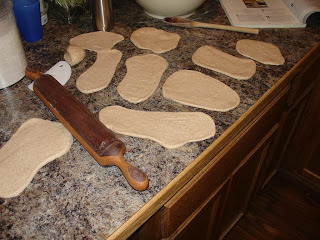 To come clean, most of the work for the buns was done by the bread machine, but I did have to shape them. As you can see, they came out beautifully (except for that one on the top left...don't know what happened to that one *smile*). And, of course, I also baked my weekly loaf of bread on Sunday. This week was just a regular wheat loaf, nothing special, but it went really well with the broccoli soup from Orangette that we had for dinner. Gingersnaps: From Cooking Light, May 2001. 1) Lightly spoon flour into dry measuring cup, and level with a knife. Combine flour, ginger, baking soda, and salt in a small bowl. Place 3/4 cup granulated sugar, butter and brown sugar in a large bowl, and beat with a mixer at medium speed until well-blended. Add the honey, vanilla, and egg, beat well. Add the flour mixture, beating at low speed until well-blended. 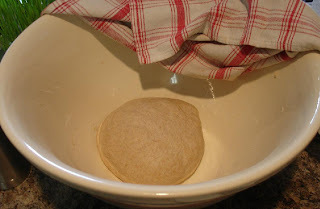 Cover dough and freeze 1 hour or until firm. 3) Lightly coat hands with cooking spray (optional, but it will prevent sticking), shape the dough into 24 (1-inch) balls. Roll the balls in a 1/4 cup granulated sugar; place the balls 2 inches apart on baking sheets. Bake at 350 for 10-12 minutes, or until lightly browned. Cool for 2 minutes on pans. Remove cookies from pans and cool on wire racks.